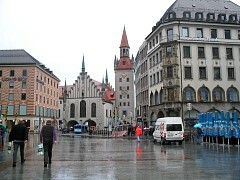 I've returned to Munich via train Monday night. Tuesday, amid rain I walked to Nymphenburg Palace. I really liked the Hall of Beauties there, but they changed it's area of display, and I felt the viewing was terrible. 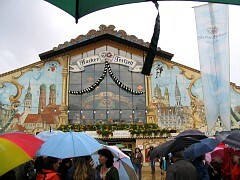 This morning I am off to explore Oktoberfest. 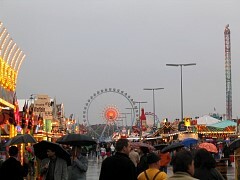 The festival is held on an area named the Theresienwiese (field, or meadow, of Therese), often called "Wiesn" for short. This morning I am just going to look around Old Town. I've bought a new map and am heading off to find the Hofbräuhaus. It's a center for English speaking people. 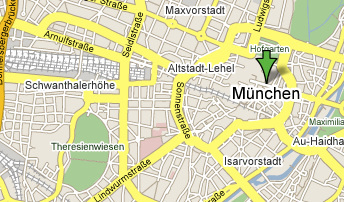 I have discovered that in Munich you have to have a map that shows the street names. That sounds strange, but I had been navigating with a "tourist" map, but not all the streets nor enough street names were shown. 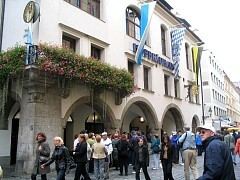 The Staatliches Hofbräuhaus in München (literally state court-brewery in Munich, also Hofbräu München) was founded in 1589 and is owned by the state government. 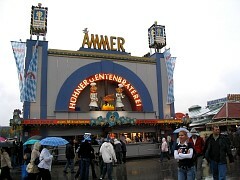 The Hof (German "court") comes from the brewery's history as a royal brewery in the Kingdom of Bavaria. 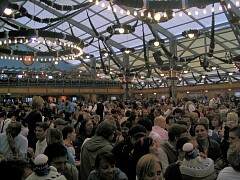 The Hofbräuhaus offers traditional German food, music, and sometimes dance combined with a nice cosy atmosphere and long, shared common tables. I got there around 10:30 in the morning and the place was beginning to fill. A German couple sat next to me and related how they lived in El Paso, Texas for five years. After they left, a group of men sat down. 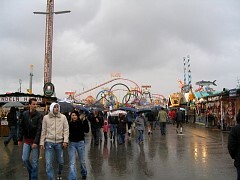 They explained they all participated in the amusement park industry in Britain, and as a group always came to Oktoberfest. The group was made up of three Welshmen, three Englishmen, and a Scot. I told them I could represent Ireland, where some of my ancestors came from. 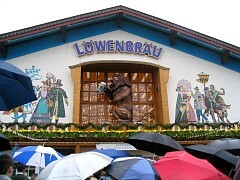 We drank and talked, and they invited me to look them up in the Lowenbrau tent, where they had reservations. Here is a map showing the relative location of the Theresienwiese. 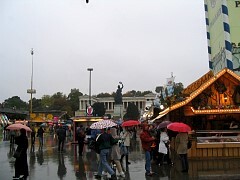 Now it's later in the day and we took the S-Bahn railway and the subway to the Theresienwiese. The rain is steady. My cousin's daughter is accompanying me because my cousin can't abide Oktoberfest. Bad weather is the risk partiers take. 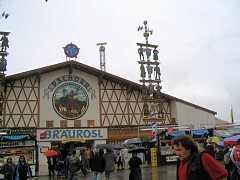 The big beer breweries all have large buildings where they sell their distinct versions of specially brewed Oktoberfest beer. All the spots in the long tables in the buildings are by reservation only. Reservations are by name, date, and time. 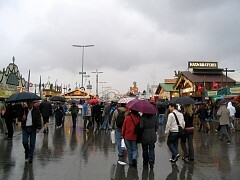 Had the weather not been so terrible, I could have hung out at Oktoberfest at the outdoor beer gardens. As it is, we are just going to walk around. 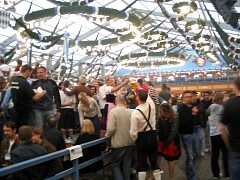 Regarding beer gardens, there is the "real beer garden test". First, you can bring your own food to a real beer garden regardless of whether they sell food themselves or not. Beer gardens developed because breweries used to plant trees atop their underground cellars to keep them cool, and the result was a really nice atmosphere to relax with a beer in hand. Beer gardens tend to open in the spring and close in the fall as the weather cools again. 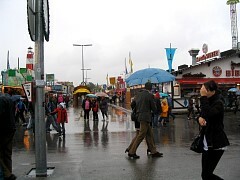 Some of the food booths. 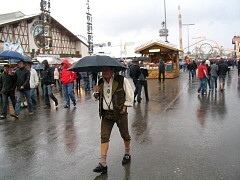 Concerning the gentleman on the right, surely their must be an authentic Bavarian umbrella? You get credit for the rest of the outfit, though ... including the trachten, a short jacket with bone buttons. 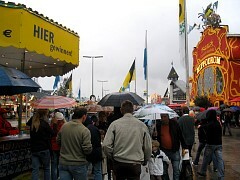 There are rides at Oktoberfest, but few riders today. We entered this beer garden looking for some of Lena's friends. 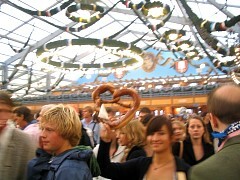 My photograph doesn't do justice to these two nice looking young Bavarians. Lena's friend wears the green Bavarian hat and leather pants. 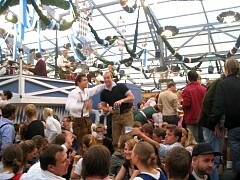 You can make out here and there among the Oktoberfest partiers beer glasses. I don't think they are large enough to be a maß or "measure" - one liter drinking glasses. The band above them is very loud and animated. 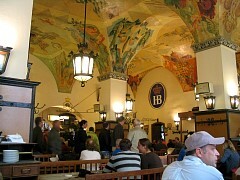 We walked through the Lowenbrau building, thinking we might run into the Britons I met in the Hofbräuhaus. I figured with Lena along, they would make room for us. Unfortunately, we didn't see them. 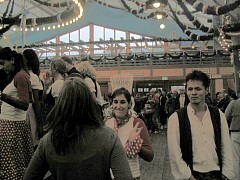 My parting artsy Oktoberfest picture.